When you get a whole pig sometimes there are parts that you might not have chosen to buy otherwise. The head is one of these. So are the kidneys and the other bits of offal. Usually we don't get the guts an animal when we shop at the store. With the pig we just bought, I got the liver and the heart. Normally I would not buy these at the store, but figuring out what to do with them was not too hard. Because if you have liver, then make pate! Technically I'm not sure if what I'm going to show you is a "pate" or a "terrine". The dish you use to cook it in is definitely called a terrine, but the thing I'm including a recipe for might be either. When I use the word pate people seem to know better what I'm talking about, although I have a feeling that technically it is a not a "pate". Nonetheless, if you have never made a pate, it is actually really simple. In the same way that a hamburger is just a flat meatball and a meatball is just a small meatloaf, a pate is just another kind of meatloaf. It’s the "Cinderella meatloaf" as Michael Ruhlman calls it in Charcuterie. If you understand that then the formula is pretty simple: grind up your meats add some flavors put them in a loaf pan and bake it long and slow. Slice and eat. Of course, being a French food, most pates have a couple extra steps (unless you make a "country style" terrine, then it is really just the same as a meatloaf). For this recipe I wanted to do something a little bit fancier than "country style". It was for our annual Solstice dinner which is a formal sit down dinner party, and I wanted to put some extra effort into it. In order to learn about the subject I turned to my favorite cook book, Glorious French Food by James Peterson. I found chapter 5 on country style pork pate to be super helpful. There is not a recipe for a fine pork pate in this chapter, but if you use the info from the introductory essay, then take into consideration the cooking instructions from the country style recipe and the mixing instructions from the duck pate recipe, you can create your own recipe for pork pate. There are 3 parts to this recipe--the fine forcemeat, the coarse forcemeat, and the garniture. The fine forcemeat is the paste that holds the whole thing together. It is also the bulk of the pate itself. If you've ever eaten Liverwurst, that is 100% fine forcemeat. I didn't want mine to taste like Liverwurst, but you get the idea for what the texture is like. After adjustments, the recipe I was using as guide called for about 8 oz. of liver meat. I had a full 2 lbs. liver so I ended up making 2.5 batches which was way more pate than I was planning on because, honestly, you can only eat so much pate before you start vomiting at the thought of one more smushy bite of it. 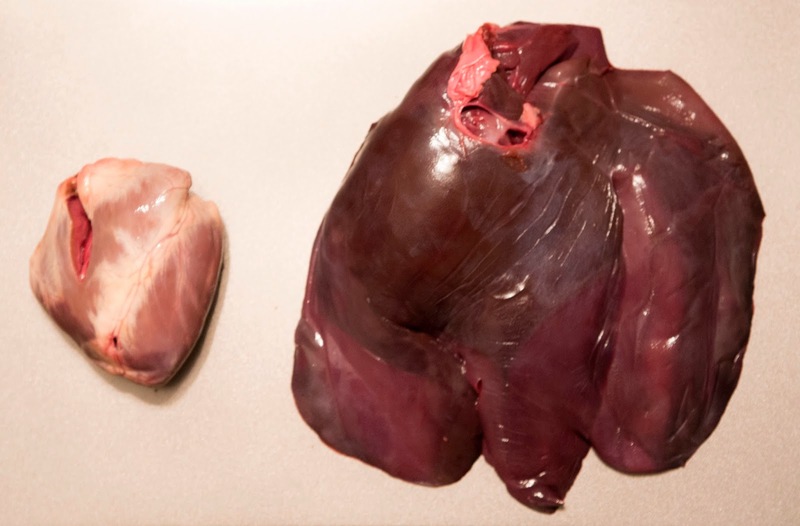 The heart and liver of a pig. These make for great pate. To begin I trimmed and pureed the liver in the Cuisinart. I wanted to keep it simple so I only used fresh crushed pepper and clove. Upon retrospect, a little nutmeg would have been good too. Also, I though the liver would be saltier than it was, so some salt might have been a good idea too. Two eggs and some chunks of back fat went in also. All of this I pureed in the Cuisinart. Then the recipe called for a little bit of milk-soaked bread to be folded in to lighten the paste. When you slice into a terrine and see the cross section, many times you see large chunks of meat and other things. The largest of these is called the "garniture" but the middle sized stuff is the "coarse forcemeat". The coarse forcemeat is there to add texture and flavor. Usually it's some kind of related meat that may have been marinated to add some depth and complexity. For the coarse forcemeat in my pate, I used the heart and some strips of shoulder meat. You may be asking why I didn't just include the heart in the fine forcemeat and be done with that slimy old thing. Well, the heart meat is chewier and leaner than most meats so I knew it would work well for texture. The thing I didn't want was big chunks of rubbery grossness in there so I carefully minced it very fine then marinated it in sherry overnight. I also minced some strips of shoulder meat and marinated them in Madeira overnight. I then added these in layers into the pate as I filled the terrine. Garniture is the fun part of the pate. Its like the ornaments on the Christmas tree. It is the crunchy parts and the sweet parts and the eye-catching bits that make the pate seem exotic. The garniture plays a couple different roles--it not only has to taste good but it really is what makes the pate look good also. Without it, the thing would just be a big block of pureed meat. With it, the pate becomes colorful and intriguing. For my garniture I shelled, chopped and roasted some hazelnuts. In one loaf I added dried blueberries and in the other I added dried cherries. The hazelnuts and blueberries (especially) were important flavors for me because I was trying to feature flavors from Sauvie Island. Every summer we come here to pick berries with the kids and buy groceries at the farms, including local nuts. Hazelnuts and blueberries both grow on the island (although I'm not certain about cherries). The garniture gets coarsely chopped and layered in with the course forcemeat. The terrine wrapped in bacon and ready for the oven. 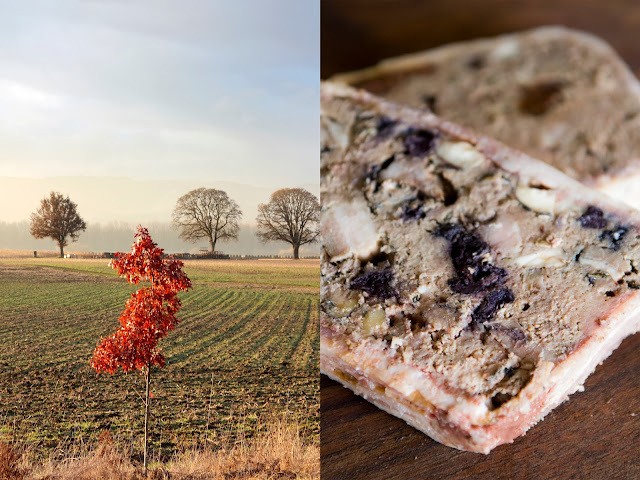 The goal is to have eye catching colors and a variety of sumptuous flavors throughout the pate, so it looks good and each bite has its own distinction. This is done by putting in some of one ingredient then layering more of another on top of that, then adding more of the other on top of that and repeating to process until all the terrine is full. There are two ways to wrap the terrine--either with leaf fat or with bacon. I don't know enough about leaf fat, so I used bacon. When it's ready, it goes in a 320 oven, covered in tinfoil and sitting in a bain-marie for a few hours until it's cooked through. Although the country style terrine recipe called for an internal temperature of 145, I cooked it to 165 because I kept getting red juices when I poked it. 170 is medium for pork, according to the Professional Chef. In the end it turned out to be a pretty good pate. I don't do pates often so I'm sure there are ways I can refine this. 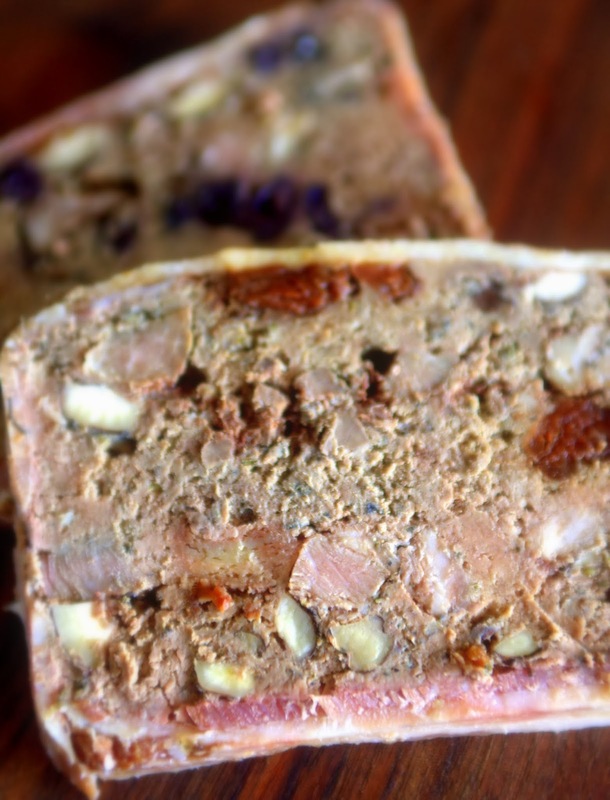 But If you find yourself with a whole pig and all the liver that comes with it, pate is a great way to go. We gotz a whole pig. This is our third pig and the second one we've bought from A Little Hope Farm. When I tell people that we got a pig a lot of times they will look at me like I'm crazy. When we talk about it, they often will say that they could never get a whole pig because they wouldn't know what to do with it! But I think that if they understood that a whole pig is not really that hard to manage and there are plenty of easy things you can do with it, then maybe they would be more willing to give it a try. As my new blog project, I'm going to blog about all the great things you can do with a whole pig. The recipes and mysteries of using a whole animal will be what I write about. 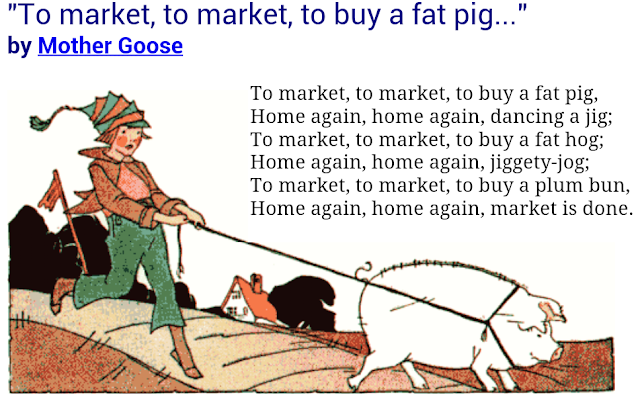 Let's start with what is required for getting and storing a whole pig. First, you must have a freezer large enough to hold all of it. Our pig takes up almost all the space in an upright freezer. That's about 13 cubic feet of space. If you have a chest freezer, make sure it's big enough, otherwise you'll be overflowing into your refrigerator and cooking up some big meals right away! Second, you also must have some willingness to explore the magical world of pork cookery. If you don't have the time or the interest, then getting a whole animal probably isn't for you. There will definitely be some parts that you need to figure out what to do with. Third, you'll need about a year's worth of time. It takes our family about a year to eat a whole pig. We don't eat pork every week and some of the larger cuts sit for a long time waiting for an occasion to use them. The fourth requirement is the willingness to spend the money. By the time the pig arrives at your freezer, it could cost anywhere between $500 and $900, depending on the size. Remember, you're buying a big supply of meat. Usually these we'd spend just as much throughout the year, but in smaller chunks as we buy little pieces one at a time. Not so with a large animal.You pay for it all up front. But, hopefully, our monthly food bill will be that much less going forward. For most people a good place to start is with a half an animal. Half gives you all the variety of cuts but with less cost and time and space required. Then, when you've cooked the last chop of your side of pork, you'll be ready to go on to the whole beast. Beyond the requirements, I like getting a whole animal because it gives me a lot to work with. I like to cook, so 235 lbs of pork is a freezer full of fun for me. Also, it keeps money in the local economy, we get a better quality product, have more insight and input on my food supply, support entrepreneurship, appreciate variety, and generally be a little more intentional about what my family eats. Also getting a locally grown whole animal is a great way to NOT support industrialized meat. Those are my reasons, at least. Here is my pig, happily eating dirt with her sisters. 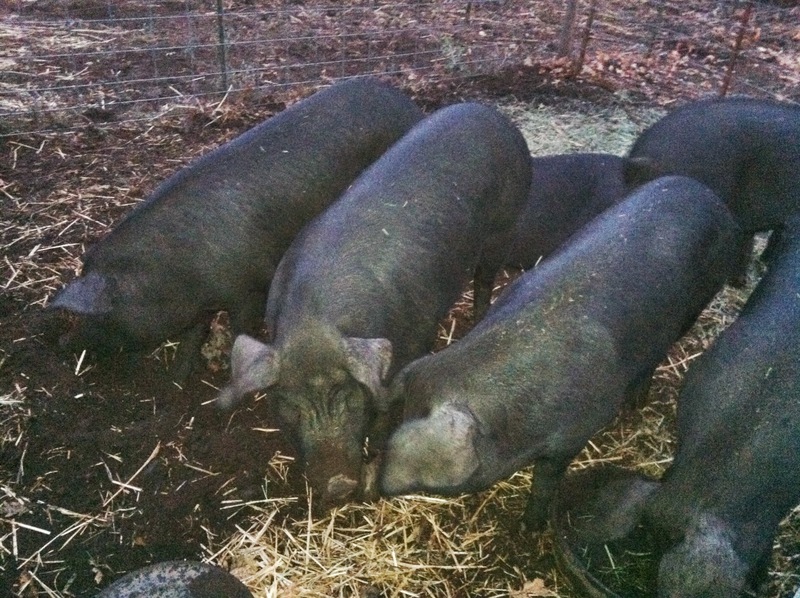 A Little Hope Farm hand mixes the grains and meals that the pigs eat, ensuring a healthy, hormone free diet. There is a 235 lbs. (hanging weight) Berkshire-cross sow in my freezer. It’s not a full carcass. It's cut and ground and wrapped into 52 neat packages. It's waiting for the pot and the grill and the oven and the smoker and the plate. It's got almost all the parts--the chops and the roasts and the sides and the skin and the heart and the liver and the hams and the trotters. It's missing some pieces that I didn't want to use again--no head and no offal (except the heart and liver). I tried the head before. Once was enough. A half a pig with most of the pieces in their places. Two hams and the sides kept whole are like the English style. This pig will have some challenges. Things are little different than pigs in the past. Mostly it’s the cuts that have changed. Normally I like the American style cuts. They lend themselves to pig pieces that go long and slow on the smoker. But this time we've got something closer to an English style cut, which means things will be a little bit different. The big shoulder roasts are cut into "country style ribs". The spareribs are not separated from the belly. We got four smaller hams rather than 2 big ones. I didn't talk directly to the butcher this time, so some of the cuts were different than I expected. That's okay. I'll figure it out and it will still be delicious. If you are thinking about buying a whole animal, here are some extra notes. Buying a whole animal certainly has some parts that require a little more thought than others. But most of these are pretty easy to solve. For instance, most people have no idea how to make bacon out of the belly. Really bacon is actually pretty simple to do. However, if you're just not into it, most butchers offer to make the bacon for you. Same with hams and other smoked or cured meats. If you get a whole animal from a farm, it's a good idea to take a few minutes to learn the basics about the cuts. They’re not complicated and it will help you understand better what you are getting. All butchers have a "standard" family style cut, but each one does it a bit different. So if you want something specific, its best to tell the butcher directly. "Hanging weight" is the total weight of the animal after it has been slaughtered but before it is processed. This is the whole carcass without the guts. Imaging sides hanging in a meat locker. The price of the meat after it has been chopped up into parts (like at the store) is called the "cut weight". When you buy whole animals from a farm, they normally charge you based on the hanging weight. Normally a pig carcass hangs for just a few days. Beef hangs longer, and the longer it hangs the more expensive it becomes. This is what "naturally aged" or "dry aged" means. Aging the meat is good because it allows some of the water to evaporate out of the meat and condenses the flavor. Also, some of the edges will be trimmed off in the butchering process. So the actual pounds of meat you take home will be less than the hanging weight which makes your effective price per pound higher. The cost that is a shocker is usually the "cut and wrap" fee. This is the fee the butcher charges to actually cut up and wrap the meat. It can be expensive ($0.50 per pound) , but its necessary and well wrapped meat will last a long time in the freezer.